Most standard motorcycles are just that, standard. Made to move your body from point A to point B, the new Benelli TNT 600 is anything but standard. With its trademark “ROAR” courtesy of its 600 cc inline-4, Italian styling, and friendly, upright ergonomics, the TNT 600 is unique in the 600 cc segment; both a capable commuter and an indulgent feast for the senses. The TNT 600’s power comes from our most advanced engine, a liquid-cooled, double-overhead-camshaft (DOHC) inline-four with 6 speeds and 4-valve cylinder head technology giving over 134 HP/L with good rideability. The frame takes the best of Italian design and uses a cast aluminum lower section combined with a steel trellis upper section. This gives the rigidity necessary for precise handling combined with superior comfort and unmatched road feel. The 17" wheels means that there is a wide assortment of tires available, ranging from DOT racing slicks to touring tires. Suspension at both ends is leading edge; with a 50 mm inverted fork up front and a laterally mounted single shock absorber in back mated to a braced alloy swingarm. Braking is amazing, of course, with race-derived two piece, 100 mm radial-mount calipers up front. The TNT 600 is a standard that is anything but. If you want to indulge in vehicle that can do it all; take a look at the TNT 600, the 600 to have. The advanced, 600 cc liquid-cooled DOHC inline four cylinder with 4-valve-per-cylinder heads produces over 134 hp per liter with a healthy torque curve. A six-speed transmission gives riders a gear for every situation and puts this eye opening power to the road. The frame takes the best of Italian design and uses a cast aluminum lower section combined with a steel trellis upper section with the engine as a stressed member. This gives the rigidity necessary for precise handling combined with superior comfort, unmatched road feel, and a spine tingling vibration that makes every ride a special occasion. In the front, the exceptional 50 mm USD forks, finely tuned suspension geometry and tuned flex from its steel trellis upper frame give precise yet stable handling. 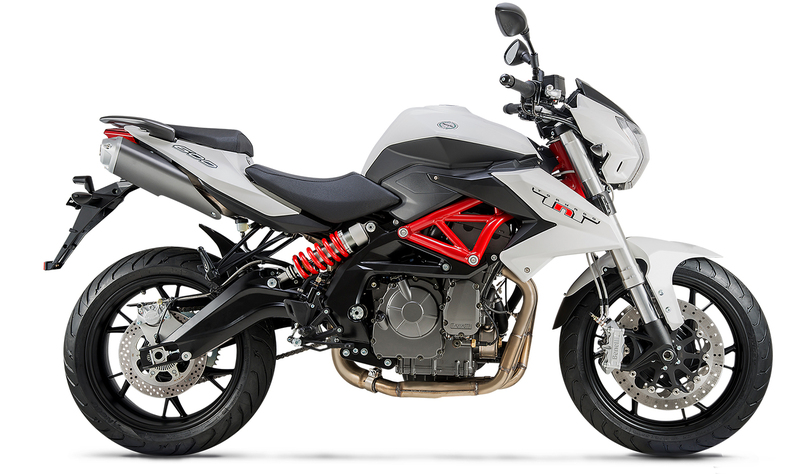 In the rear, a laterally mounted shock absorber with adjustable rebound and pre-load controls a super rigid, braced aluminum alloy swingarm. 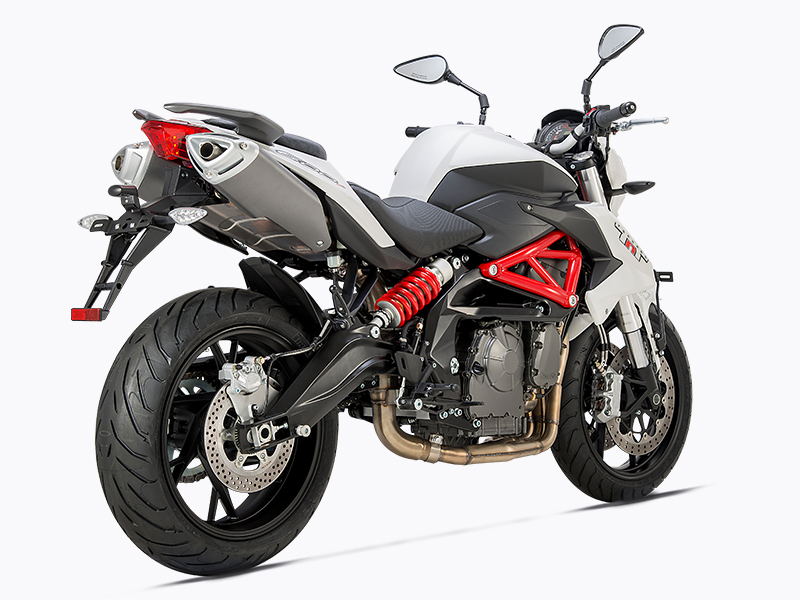 This suspension accommodates a wide variety of rider weights, and gives the superior suspension feel that Benelli has been know for. Lightweight cast aluminum wheels reduce rotating weight, making the motorcycle very agile and responsive. The brakes are industry standard 320 mm floating rotors gripped by 100 mm two piece calipers. Pirelli Angel ST tires are the rubber that meets the road with a 120/70-17 tire up front and a 180/55-17 tire in the rear. In 1911, Benelli developed our first bike, but in 2004, with the launch of the Tornado Naked Tre 1130, the legend of the special Benelli "roar" began. That fantastic and unique soundtrack stirs the soul while moving body and is featured in everything we make. As the flagship of the Benelli lineup in the USA, the engine is a structural member and when revved, give a unique spine tingling sound and feeling that makes every ride a special occasion.